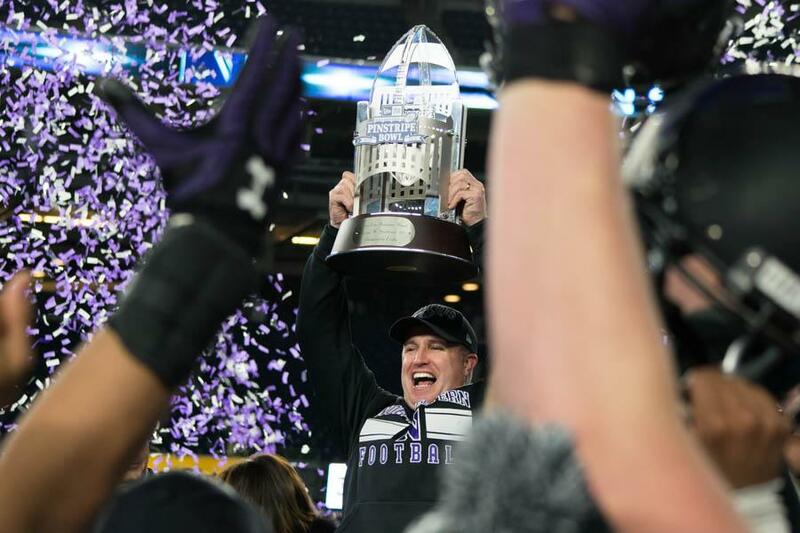 Coach Pat Fitzgerald raises the George Steinbrenner Trophy after Northwestern's Pinstripe Bowl victory. Fitzgerald is the first coach in program history to win two bowl games. NEW YORK — Yankee Stadium was in a Northwestern state of mind. Capping off a season that started bleak, the Wildcats (7-6, 5-4 Big Ten) defeated No. 23 Pittsburgh (8-5, 5-3 ACC) 31-24 in a see-saw Pinstripe Bowl on Wednesday. NU racked up 462 yards of offense against the Panthers, including a career-high 224 rushing yards from junior running back Justin Jackson, on its way to its third bowl win ever. The ghosts of bowls past did not haunt the Cats this December. At the beginning of Fitzgerald’s coaching tenure, NU lost four consecutive bowl games, all by 11 points or less. Additionally, the Cats were shellacked 45-6 by Tennessee in last year’s Outback Bowl. But none of that mattered for NU, which won just its second bowl since 1949 despite beginning the season 1-3. Fitzgerald said stopping Pittsburgh’s efficient red zone offense was key. The Cats and the Panthers traded scores all afternoon, with neither team holding a lead larger than 4 points after halftime until a Jack Mitchell field goal late in the fourth quarter gave NU its decisive 7-point margin. Pittsburgh had a chance to drive downfield and tie the game with just under two minutes left, but junior safety Kyle Queiro picked off Panthers quarterback Ben DiNucci to seal the victory. Pittsburgh’s offense, which came in averaging 42.3 points per game, was largely held in check thanks to four forced turnovers. The Panthers’ 24 points were a season low, and Queiro said the Cats’ defensive performance was fueled by young players rebounding from early-season struggles. “That definitely gave us, the underneath guys … a sense of confidence that we can play aggressive on these guys,” Queiro said. Jackson, meanwhile, was firing on all cylinders from the opening kick. The junior racked up 149 rushing yards in the first half and ended the afternoon with three touchdowns. Earning MVP honors, Jackson said the team needed to get the running game more involved after last year’s Outback Bowl loss. With the 2016 season fully in the rearview mirror, the Cats will turn their attention to next year. A season that began on a sour note ultimately became history for all the right reasons, and NU plans to savor the moment.